Des Ong is a specialist freelance wildlife photographer who has travelled all over the world and won several awards. His talk ‘Captivating Nature – Wildlife of Britain and Beyond’ encompasses a wildlife photographer’s year from the Cairngorms, the high mountains of Norway in winter to the pristine rain forests of Borneo. It promises to be a first class presentation. Our September talk was presented by Ian Newton from York in front of a capacity audience at the Friends Meeting House in Bakewell. His talk about Iceland was accompanied by some amazing images of spectacular waterfalls and the special breeding birds including red necked phalaropes and barnacle geese, a species previously thought only to breed in Greenland. 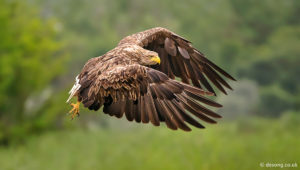 The quality of Ian’s photos was truly breathtaking but we anticipate this talk will be just as good if this photo of a white tailed sea eagle is anything to go by. This entry was posted on 6th August 2016 by Dorothy Evans.